Congratulations to Ben, Tudor, John and Craig whose work on the kinetic resolution of BINOLs has just been published in Angewandte Chemie. Angew Chem. Int. Ed. 2019, 58, 4596. Congratulations to Arseni, whose work with Igor, Jason and Vítor from the Paul Beer group on the development of molecules to selectively bind weakly hydrated ions in water has just been published. J. Am. Chem. Soc. 2019, 141, 4119. Congratulations to Alison, Antti and Yao on their collaboration with Jacqueline from Rob Paton's group. Angew Chem. Int. Ed. 2019, 58, 2795. Congratulations to Nick Parker (4th year SBM CDT student) for winning the Royal Society of Chemistry's Organic Division Poster competition with his work "Visible light mediated cyclizations of enones". Martin has a profile published in Angewandte Chemie - you can read it here. Congratulations to the Late Stage Functionalization team on their collaboration with UCB on light mediated sulfonylation of anilines. Chem. Sci. 2018, 9, 629. 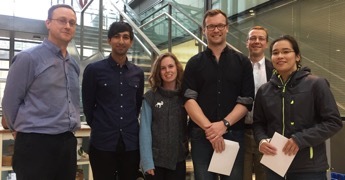 October 2017: Congratulations to Kat (pictured far right) on winning one of the AstraZeneca-sponsored prizes for her talk titled "How does enantioselective phase transfer catalysis work?" at Oxford Chemistry's graduate seminar. Angew. Chem. Int. Ed. 2017, 56, 9468. Congratulations to the Late Stage Functionalization Team on the group's recent collaboration with UCB on late-stage cyanation. Chemistry Eur. J. 2017, 23, 14733. Angew. Chem. Int. Ed. 2017, 56, 15555. Nature Chem. 2017, 9, 558. Angew. Chem. Int. Ed. 2016, 55, 14306. Angew. Chem. Int. Ed. 2016, 55, 13813. Angew. Chem. Int. Ed. 2016, 55, 13180. Nature Chem. 2015, 7, 171.